Amid Crisis, Al Mokha Brings Y..
At The Coffeewoman Panel: "Bui.. The aesthetics of the new Corvus location is similar to that of their existing cafe/roastery, only everything is a little more sleek and clean. Rather than giving customers a peak behind the production curtain like the original space does, the new cafe highlights a cold brew cocktail menu created with towering Kyoto drippers and owner Phil Goodlaxson’s eye for aesthetics and grandeur. Already a titan of the cold brew industry, the Kyoto drippers allow Corvus to make smaller batches and tinker with multiples coffees at the same time, all of which results in refreshing, juicy cocktails. It’s worth noting the new location is equipped with a Synesso Hydra espresso machine and two Alpha Dominche Steampunk brewers, which give baristas full control over both making drinks and conversing with customers. Tucked away in the booming Tech Center area, Denver’s southernmost roaster is primed to draw in everyone from folks living across the street, to those commuting from Aurora or Englewood in the mornings, to the curious few interested in seeing what Corvus has done with over two years’ worth of planning. Corvus Coffee is located at 4925 South Newport Street. Visit their official website and follow them on Facebook, Twitter, and Instagram. Family-owned, family-run, and proudly serving house-made pastries, breakfast burritos, juices, and chai—with so many different coffee shops throughout Denver, the new Downpours in Congress Park stands out because of the quality of its products and palpable approachability. Nothing about this cafe is flashy—it’s equipped with a two-group La Marzocco Linea Classic espresso machine and a BUNN brewer behind the bar. The building, over 20 years old, has an ideal facade for sitting outside on a sunny day or stopping by while walking the dog. The business and the space reflect the practicality that defines Downpours, and the reason they got into making their own pastries in the first place—why buy from someone else if it can be done better in-house? While serving up good coffee doesn’t stand out in a competitive scene, delicious homemade pastries do. Co-owner Michael Hammerquist has already partnered with multiple other shops to serve his croissants, and Downpours itself could be due for another expansion soon. Downpours Coffee is located at 1200 Clayton Street. Visit their official website and follow them on Facebook and Instagram. Long before just about any other specialty coffee shop had been established in Denver, Crema Coffee was building its reputation out of a tiny space with a menu painted on the wall. Today, Crema’s second location is a coffee bodega inside the shimmery Denver Central Market, just a couple blocks away from the first. In true Crema fashion, the bodega is a forward-thinking location, where a person can stop by for either a cappuccino or to pick up grocery staples like milk, eggs, and Stumptown Coffee Roasters cold brew. There’s also a butcher shop, bar, pizza shop, and ice cream parlor to peruse mere feet away. There are a couple of stools in front of Crema’s Synesso espresso machine, where customers people-watch while sipping. Owner Noah Price has said that the original Crema location will be the company’s only traditional cafe, but that he’s open to opening more bodegas. This approach challenges the notion that new cafe locations should “Yes And” whatever came before them. Just as it was when Crema first opened nearly a decade ago, the bodega is serving up an interesting take on coffee in Denver. Second locations often mean bigger, brighter, conceptually more adventurous, and maybe boozier, but for Price it means less, it means smaller—it means bodega. 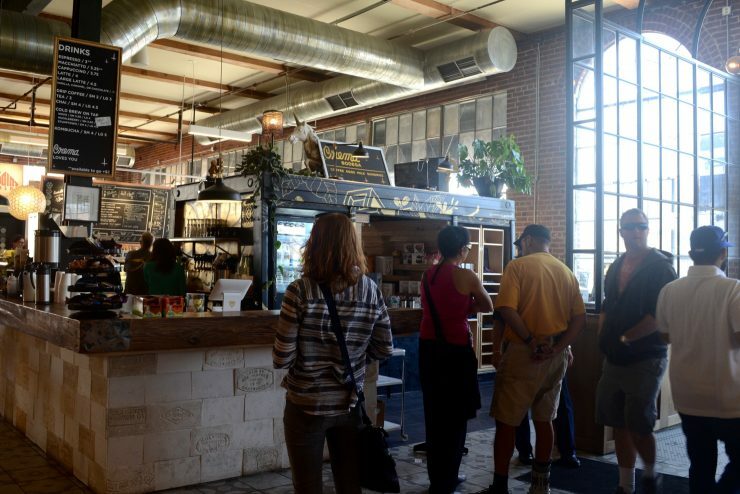 Crema Coffee is located at The Denver Central Market at 2669 Larimer Street. Visit their official website and follow them on Facebook and Twitter.